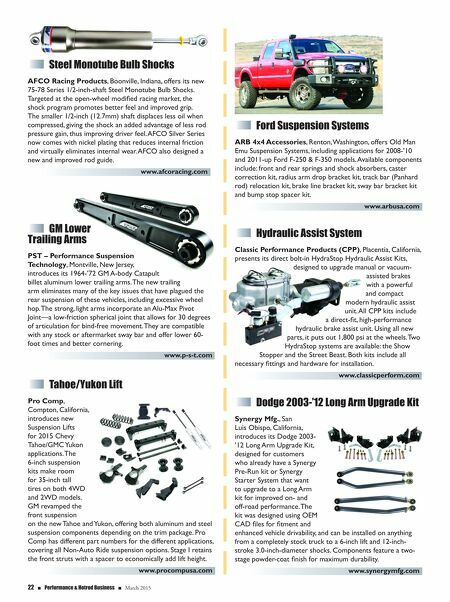 March 2015 n Performance & Hotrod Business n 23 Brake Booster Repair Kit Harmon Classic Brakes, Valley Glen, California, presents the Midland Brake Booster Major Repair Kit. Now available for Mustang, Cougar, Cyclone, Fairlane, Montego, Torino and Ranchero (1967-'70) applications, the kit restores the brake booster back to OEM performance. The company carries a complete line of obsolete Midland, Bendix, Delco and Kelsey-Hayes brake booster parts and assemblies. www.harmonclassicbrakes.com GM Truck 2WD Lifts MaxTrac Suspension, Anaheim, California, offers its complete line of leveling, lift and lowering suspension solutions for late-model trucks and SUVs, including two-wheel drive GM applications. The affordable new 4.5- and 7.5-inch Lift Kits for 2007-'14 Chevy and GMC 1500 pickups feature spindles that address suspension geometry to ensure improved ride and handling characteristics. Constructed of cast ductile iron, the spindles are beefed-up in key areas to handle a larger tire and wheel package and are machined to precise manufacturer specifications. 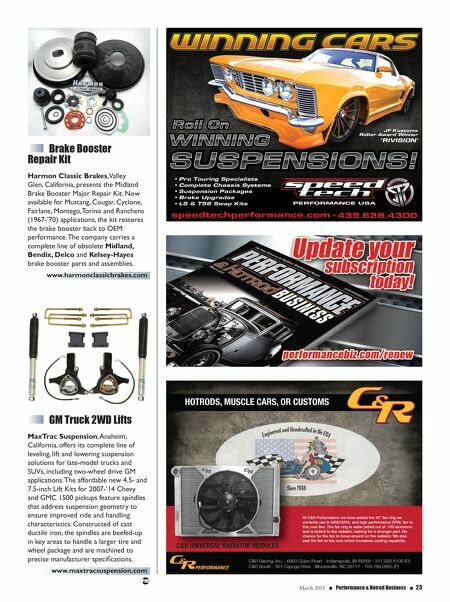 www.maxtracsuspension.com HOTRODS, MUSCLE CARS, OR CUSTOMS At C&R Performance we have added the 16" fan ring we currently use in NASCAR®, and high performance SPAL fan to this new line. The fan ring is water jetted out of .100 aluminum and is bolted to the radiator, making for a stronger part. No chance for the fan to move around on the radiator. We also seal the fan to the core which increases cooling capability.